Click for link to Presbyterian Church in Ireland web site. 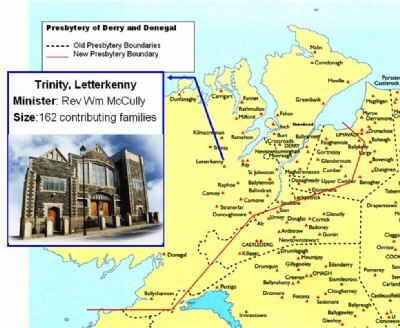 Presbyterianism in Letterkenny dates back more than 350 years when the Rev. William Semple officiated from 1648 to 1674. The regular 'Meeting House' then was on Main Street, probably a large thatched building. In 1820 the Seceders established a congregation on the Port Road at Barkhall, and eventually this became known as Second Letterkenny and the original church as First. During 1840 there was a split, and in 1841 Third Letterkenny was erected beside the Parish Church. This renovated building in now Trinity Hall. In 1858 Second Letterkenny was dissolved and 'Third' became 'Second' before adopting the name 'Trinity' in 1916. First Letterkennywas completely rebuilt in 1909 but 12 years later was destroyed by a fire. The other congregation offered the use of its premises. This brought them closer together which paved the way for a union in 1925 under the Rev. Dodds. The building on Main Street was restored and the name 'Trinity' was officially adopted. Also, Gortlee Reformed Presbyterian was also adopted into this union. In Letterkenny Presbyterian Church we are committed to teaching the Bible in a clear and contemporary way. Our aim to show that it is a relationship with Jesus that is essential for eternal life. not just a belief. God 'is knowable' through Jesus Christ and the work of the Cross, and in coming to know Him personally then eternal assurance is guaranteed. Trinity Tots was set up in 2003. Mums, Dads, Grandparents, Carers and of course babies and toddlers meet every Thursday morning in Trinity Hall at 10.30 a.m. to relax, chat and have fun! For most of us, our highest aspirations are for the future of our children. Children are full of natural curiosity and wonder. It's both a great challenge and reward of Trinity Tots to satisfy these uniquely human traits. During the session the children play with a wide variety of toys in a safe and secure environment. They learn social skills, essential to the all-important early formative years, play and interact with children and adults alike and form friendships which will be of great benefit to them in their first schooldays. The adults enjoy a chat and a cuppa, not to mention sharing great tips on teething remedies and coping with the "terrible twos" and "troublesome threes"! Everyone is assured of a warm and friendly welcome at Trinity Tots! According to reliable records, it is over 350 years since the first Presbyterians came to Letterkenny. The first minister we know much about was a Rev. William Semple who officiated from 1648 to 1674. During this period he suffered many trials and persecutions, both from the Puritan Independents who were in power at that time, and later from the Episcopacy. At one period he was excommunicated and imprisoned in Lifford for five or six years. The next minister was William Liston (1677-1695) and he too had to endure many trials and also spent a few months in Lifford jail. The promied stipend at this time was £30 per year and very often this was not paid in full. By this time the congregation had a regular 'Meeting House' which was probably a large thatched building with an earthen floor and very few, if any, fixed furnishings. The members provided their own benches or stools, or stood in places allotted to their district. There is no record of pews until around 1699 and these were installed privately, the people renting the space from the Session. After the death of Mr. Liston in 1695, the Letterkenny congregation was without a minister for several years and was looked after by Rev. Seth Drummond of Ramelton. It is interesting to note that at this period there are names mentioned in the congregation which, are still common in the district, such as Stevenson, Colhoun, Black, Ramsay, Russell, Wilson, Gailey, Blackwood, Glenn and White. A new development took place in 1820 when the Seceders established a congregation on the Port Road at Barkhall (now Barkhall School) and eventually this became known as Second Letterkenny and the original Church as First Letterkerny. Rev. Dr. Spratt was the minister of Second from 1821 until his death in 1858. During 1840, there was a split in First Letterkenny arising mainly from the fact that a section wished to call a local man as minister. A Meeting House was built in 1841 beside the Parish Church and was known as Third Letterkenny. Rev. Oliver Leitch (born at Crieve) was ordained in the newly formed congregation on 25th March, 1841 and ministered there until a month before his death in 1893. In 1894 Rev. Ross Millar was installed as minister and remained there until he retired in 1925, when the union with First Letterkenny took place. In 1909 during Rev. Logan's ministry, First was completely rebuilt and then in August, 1921 it was entirely burned out through incendiarism. Immediately after the fire, Trinity Church (now Trinity Hall) offered the homeless congregation full use of their Church. This event brought the two congregations much closer together and greatly helped to pave the way for complete union which took place in 1925, under the ministry of Rev. A. M. Dodds. Advantage of the situation was also taken to complete the union of Gortlee Reformed Presbyterian Congregation with our own. Now as we face the future, it is our privilege not only to retain what we have inherited from those who served the congregation in the past, but to press forward wholeheartedly for some further advance in the work of the Church in our generation.